Cockatiels are social birds who often enjoy spending time interacting with their human caregivers. If your new cockatiel does not want to come out of his cage he may not have been tamed properly or he may be having a hard time adjusting to his new home. The methods you use to get your cockatiel out of his cage can influence how your bird feels about being handled by you. If you absolutely must get your cockatiel out of his cage immediately, then it is certainly possible to do so. If you do not mind the chance of being bitten, you can use a towel or blanket to physically capture your cockatiel while he is inside his cage. Bird nets are sold in pet stores and intended to be used for catching birds who do not want to be caught. A net will allow you to capture the bird by trapping him in it and removing him from the cage. However, being trapped with a net is a traumatizing experience for your bird. If you want him to come to you willingly, you will be better off spending the time teaching your bird to willingly come to you. Chances are, if your cockatiel will not come to you and allow you to remove him from is cage while he is on your hand, then he was not tamed properly to begin with. You will need to spend a significant amount of time taming your bird before he can easily be handled, but the time is worth it since cockatiels live an average of 15 to 20 years. Start taming your cockatiel by spending as much time as you can talking to him every day. Learn what your bird's favorite treats are and use those treats to encourage him to approach your hand when you place your hand in his cage. Eventually, your bird will learn that a human touch equals getting a reward and he will allow you to handle him voluntarily. Once your cockatiel is willing to come to your hand, teach him to step up onto your finger on command. Slide your hand gently along the ground in the cage until you reach your cockatiels feet, gently apply pressure and encourage him to step up while telling him a command such as the word "up." Reward your cockatiel for stepping onto your hand or finger with a treat or by petting him. 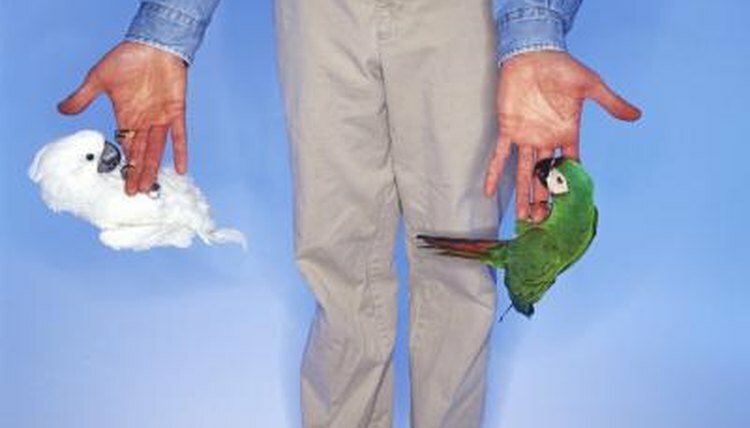 Once your bird has mastered stepping up onto your hand, gently remove him from the cage while he is perched on your hand. Before your remove your cockatiel from his cage, make sure the environment in the room outside the cage is free of predators and sufficiently bird-proofed so that your cockatiel cannot injure himself. If your cockatiel bites you, do not yell at him or punish him. Cockatiels often bite when they are frightened and punishing your bird will convince him that you pose a threat.